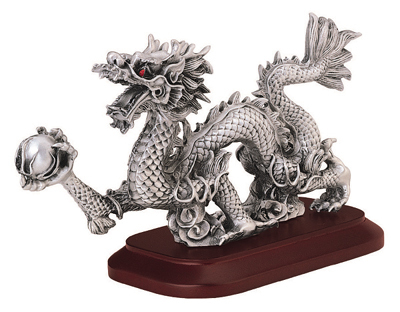 The Pewter Dragon is perhaps the most popular animal symbolic in Chinese culture and depicted carrying a 'pearl' globe. It is the symbol of denotes power, wealth luck, prosperity, and even helps by strengthening work prowess and skills. The Pewter Dragon is kept to invite good fortune,success, achievement, ambition and power into the household or business areas. The Pewter Dragon is made of high quality pewter. Pewter is metal, a very useful and popular element in Feng Shui.